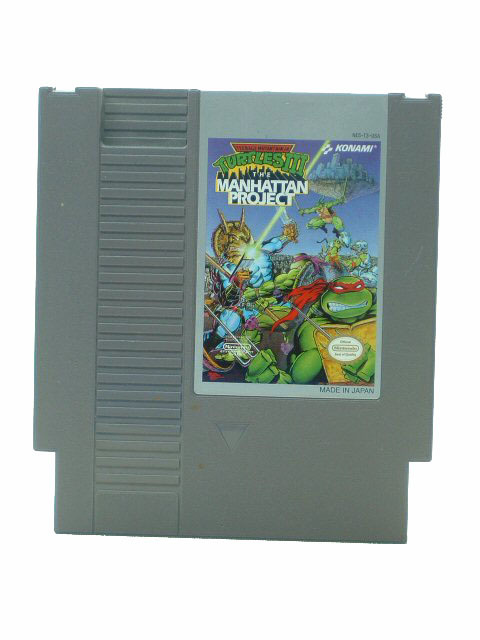 Experience the most incredible action-adventure gaming with the Teenage Mutant Ninja Turtles III: The Manhattan Project video game, designed for Nintendo. The plot of this single-player and cooperative Nintendo video game starts with four ninja turtles enjoying their deserving holiday trip to the fullest, after defeating the enemies of the town. But to their surprise, Manhattan is again in danger as the evil Shredder is in town and had abducted April O' Neil, a news reporter in this Action-adventure game. The player in this Nintendo video game can choose to play as any of the four ninjas - Leonardo, Raphael, Michael Angelo, and Donatello. All the turtles are equipped with their own unique signature weapon. Advance through 8 exciting levels of the Teenage Mutant Ninja Turtles III: The Manhattan Project video game including Typhoon Tide Pool, Baron Von Spleen's Battle Barge and other challenges to get hold of Shredder in the ultimate level.. Show how powerful and alert you are by avoiding traps, tricks and obstacles and thrash your enemies in this Action-adventure game. The third Teenage Mutant Ninja Turtles game released on the NES has you battling your way through eight levels as you walk, surf, and otherwise make your way back to Manhattan. While the turtles were on a much-needed vacation, the evil Shredder, with the help of his ally Krang, made off with the entire island of Manhattan. Now, it is up to you to help Leonardo, Raphael, Michaelangelo and Donatello return to the Big Apple and save the day. All four ninjitsu-trained turtles are at your disposal, but you control just one at a time. If you let one turtle run out of pizza energy, you must select another. Each turtle can attack with his weapon of choice, execute a Jab & Toss, and pull off a Flying Flip Kick and a Flying Ninja Kick. There are also four special attack moves, one for each turtle: Leonardo's Cyclone Sword Spin, Donatello's Knockout Roll, Michaelangelo's Kangaroo Kick and Raphael's Power Drill Attack. In addition to fighting Slash, Leatherhead, Bebop, and other sworn enemies of the Teenage Mutant Ninja Turtles, you must deal with a crumbling bridge, a maze of sewer passageways, the terrors of Shredder's lair, falling obstacles, and much more. Ultimately, you must brave the dangers of Krang's spaceship and seek out and destroy the Gorgon Gravitation Device. While you cannot save your progress in the game, Teenage Mutant Ninja Turtles III: The Manhattan Project lets you continue as many as three times.